Oklahoma City • The Jazz’s best defensive sequence of Sunday’s Game 1 against Oklahoma City came during the timeout between the third and fourth quarters. Paul George’s buzzer-beating shot was reviewed and ruled a 2-pointer, instead of a 3. That explains how the Jazz held George to 36 points in the Thunder’s 116-108 victory at Chesapeake Energy Arena. The purpose of this postseason from a Jazz perspective is to find out more about these guys as the franchise moves forward. The trouble with the big picture is it tends to get obscured by the immediate view on nights like this, when star power takes over in the NBA. Jazz rookie Donovan Mitchell showed in his playoff debut that if he’s not yet in a class with George and OKC teammate Russell Westbrook, he’s close. That’s encouraging, looking ahead. For the Jazz to play deep into this series or even win it, though, they will need some cooperation from the Thunder. If George is going to keep hitting 8 of 11 shots from 3-point range, what can you do? Jazz coach Quin Snyder would never say it so caustically, but he made the same point about George. Sometimes in this game, you “tip your hat when they’re able to hit contested jump shots,” Snyder said, citing “certain plays that I’m not sure you can do a whole lot more” about defensively. 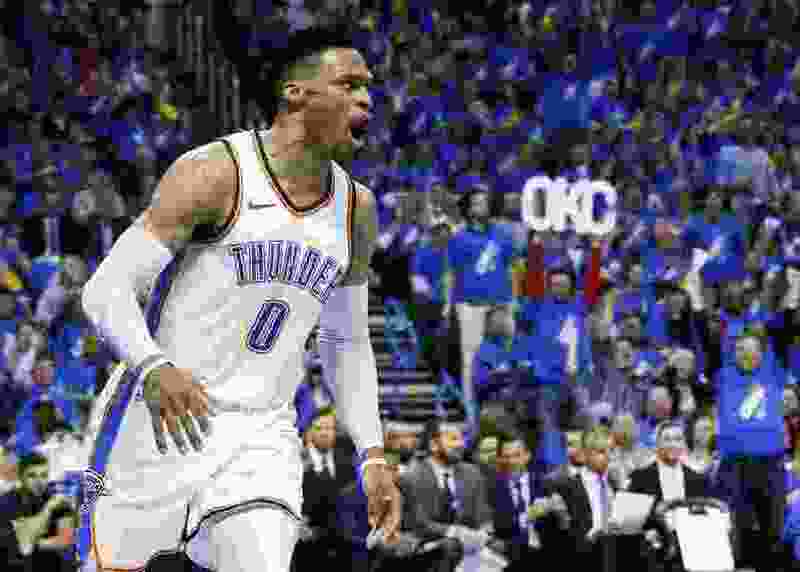 Mix in Russell Westbrook’s 29 points, 13 rebounds and eight assists, and the theme became clear: If the Thunder keep doing what they do, this could turn into a short series. These teams posted the same regular-season record (48-34) and there’s a strong argument that the Jazz would have won a bunch more games with a healthy Rudy Gobert. Yet the reality is All-Stars own the playoffs, and the Thunder have them. Can the Jazz play better? Of course. They can get improved shooting from guard Ricky Rubio after his 5-for-18 showing in his NBA playoff debut. They can keep the Thunder from scoring 19 second-chance points, with a remarkable conversion rate of OKC’s nine offensive rebounds. They might try making more 3-point shots of their own; at one stage, the Jazz were 8 of 23 and the Thunder were 13 of 27 from 3-point range. That accounts for a 15-point differential. Some analysis might go deeper, but there’s also danger in overthinking this stuff. George, especially, made shots that he won’t keep making. Or will he? “We played great defense,” Mitchell said. That might be a stretch. There was the sequence when Jonas Jerebko became the primary defender on three straight possessions, and the Thunder scored seven points. In the third quarter, Joe Ingles gave up a George 3-pointer after running into Steven Adams’ screen. That happens sometimes; what’s less acceptable is Ingles’ complaining to the officials after the Jazz’s subsequent turnover, while the Thunder quickly inbounded the ball and Westbrook pushed it ahead to George for another 3. Game 1 was fun, for a while. The Jazz enjoyed an 11-0 run in the first quarter, which ended in a 25-all tie. OKC then surged ahead for good. Last April, the Jazz lost Gobert to injury in the first 10 seconds, yet they rescued a victory via Joe Johnson’s buzzer-beating shot and eventually won the series. They’re already in a tougher spot now, against a better team than those Los Angeles Clippers. The Jazz themselves are much different, and their future is promising. Are they good enough to win a playoff series right now, though? Here in Oklahoma, we’re fixin’ to find out. Game 2 is Wednesday.